Note: If you are installing this kit on a 2001-2010 bike, you will have to replace the factory lower cowl with one from a 2012-2017 bike or with a Show Chrome B52-908 chrome lower cowl. 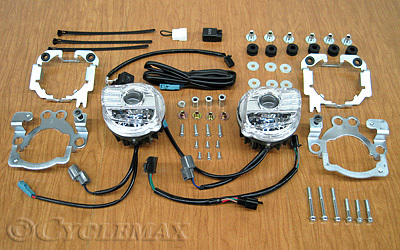 Also, if your bike is a 2001-2005 model, you will need to purchase a B52-765 light harness adaptor kit separately. Be sure to select the correct kit for your bike from the drop down box when ordering. This will insure that you get the correct switch for your bike.